This article is about the modern Welsh town. For the medieval cantref, see Buellt. 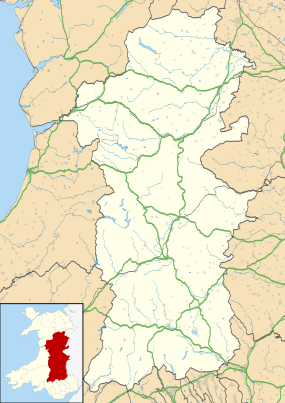 Builth Wells (/ˈbɪlθ ˈwɛlz/; Welsh: Llanfair ym Muallt) is a town and electoral ward in the county of Powys, within the historic boundaries of Brecknockshire, mid Wales, lying at the confluence of the River Wye and the River Irfon, in the Welsh (or Upper section) of the Wye Valley. It has a population of 2,568, or 2,994 including the neighbouring village of Llanelwedd in Radnorshire. Builth is an anglicization of the Welsh Buellt or Buallt. It derives from the Welsh words bu, meaning "ox", and gellt (later gwellt), meaning "pasture", rendering "cow pasture". The town added "Wells" to the name in the 19th century when its springs were promoted as a visitor attraction. The Welsh name Llanfair-ym-Muallt means "St Mary's Church in Buallt". Builth first emerged in post-Roman times, probably on the other side of the Irfon river from its present site at Dol Eglwys (Church Mound) where a ruined early medieval church is thought to have stood. Vortigern, the British ruler alleged to have invited the Saxons to Britain is sometimes said to have owned land in nearby Builth Road on the Radnorshire side of the River Wye; the site previously having been known as Cwrt Llechrhyd. Early Post-Roman Builth was an independent kingdom. The most famous ruler was Elystan Glodrydd from whom many local gentry claimed descent. As an important component of Rhwng Gwy a Hafren, a political entity referred to in the poems of Taliesin, Builth was regularly at war with the Kingdom of Powys. 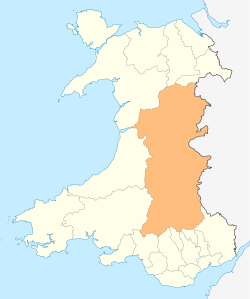 Ecclesiastically, the Deanery of Builth has always been part of St Davids / later Swansea and Brecon, rather than St Asaph, the Powys diocese. Glodrydd probably lived at Llanafan Fawr rather than the modern site of Builth Wells. Until the foundation of the Norman town Llanfair ym Muallt the main settlement was Llanafan. Stories about Philip de Braose centre on Llanafan not modern Builth. 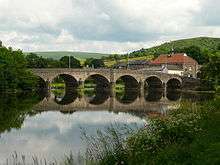 The site of the town controls an important ford across the Wye and the crossing point of the main north-south route in Wales and an important south-west-east route. It was militarily and economically significant for centuries. The Welsh name for the town "Llanfair ym Muallt" refers to the foundation of a Norman church dedicated to St Mary. The churchyard is however, a truncated oval which is strongly suggestive of an original Celtic foundation. The town was laid out as two streets connecting a castle and a church and was protected by a hedge rather than a wall. This type of town is sometimes called a Bastide, a kind of medieval market settlement. In exchange for rights to live and trade in the market of the new town skilled townspeople paid the lord various dues. In many parts of Wales the skilled workers were of Flemish or English origin. However, Builth may have had important significance in Welsh language culture as The Mabinogion was long thought to have been recorded in its final form by medieval monks here and recent historical opinion has shifted to a view that it was written down by a lawyer in Builth. Despite repeated destructive fires, at one time involving a charitable collection in London, Builth Wells grew as a traditional Welsh market town. It received major boosts from the development of toll roads; it was at the centre of early road networks and the arrival of the railway at Llanelwedd. The railway allowed it to develop as a spa, and is well known nationally as the location of the Royal Welsh Showground, home to the Royal Welsh Show (although the showground is actually over the river Wye in Llanelwedd, Radnorshire). The only remains of the castle are huge earthworks. Builth Castle was built under King Edward I, the construction taking nearly five years in the 1270s. It replaced several earlier castle built by the Marcher Baron Philip De Braose who claimed the area as a Marcher lordship (Marcher lords were substantially independent of the King of England and the Prince of Gwynedd). There may also have been an earlier castle at Caerberis (the fort of Peris) on the north side of the River Irfon near (protecting?) the original settlement. Owain Glyndŵr's forces attacked Builth Castle when it was in the charge of John Oldcastle during the rebellion of Owain Glyndŵr and it was repaired in 1409, the bill being £400. 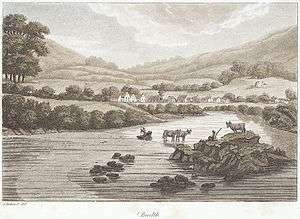 Llywelyn ap Gruffudd, Prince of Wales, often remembered as Llywelyn Ein Llyw Olaf came South from Gwynedd to the vicinity of Builth Castle in December 1282. There is evidence of treachery from the occupants of the Castle, supposedly promising support for the Princes cause, and it is recorded that Llewellyn sent his army to "receive the homage of the men of Brycheiniog" whilst he remained nearby with just a small bodyguard to liaise with persons, whose identity has never been positively identified, who had promised to give him support. it is very probable that the Mortimers were involved in this plot. Unfortunately the ruse was successful and Llewellyn, separated from the main body of his forces was surprised and killed by the Norman French. He was not immediately recognised but mortally wounded and it was only when the Normans returned in search of plunder that he was recognised and killed. His Seal and other items were discovered in the most secret part of his body. He was beheaded and his head was displayed on the highest part of the Tower of London. A monument to Llywelyn at nearby Cilmeri, near to where he was killed by the Normans receives many visitors, especially on the anniversary of his death. In another version, he was killed by chance (as medieval nobles usually captured each other for ransom) and his body not recognised until later. This is sometimes referred to as the battle of Irfon bridge. He had come south to rally the men of the Lordship of Builth in December 1282, after the war in North Wales had paused following the defeat of the Normans at Menai Straits. 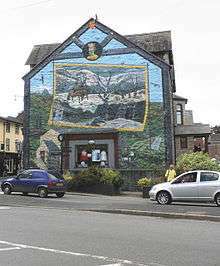 In the centre of Builth Wells there is a 1000 feet square mural (approx 35 feet high by 30 feet wide) depicting the final days of Llywelyn ap Gruffydd, the last native Prince of Wales. The mural shows Llywelyn and his men, a scene depicting the fighting and a representation of Builth Castle, where Llywelyn was turned away when trying to flee from the English. It also shows a blacksmith - Madoc Coch - who reversed the horseshoes on Llywelyn's horse so that the prints in the snow would look as if he was travelling in the opposite direction when fleeing from his ambushers. The mural was designed by Ronald Swanwick and painted by Ronald Swanwick and Neil Chambers. The White Bull of Builth may be a reference to a herd of White Park Cattle that lived in the area from Post-Roman times. Two herds survived in Wales to modern times. The laws of the time suggest that the medieval and later economy of the Welsh borders was strongly dependent on cattle. The Hereford cattle breed, named after Hereford market where it was most prominently sold was the main breed of the Welsh borders. 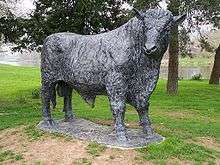 Builth was the market for a variant of the Hereford called the Builth Smokey Face. This was the traditional animal of the area but the breed has not existed for many, many decades. The Welsh Black cattle have very little to do with the history of Builth, except in so far as Cardiganshire cattle-drovers drove herds of cattle through Builth to markets in England. Beef cattle have largely vanished from the area. The Beulah Speckled Face is a local breed of sheep. Nearby Mynydd Epynt was famous for its horses until it was seized for military training purposes. The beef cattle market has vanished and economically sheep are now vastly more important than cattle with consequences for the traditional woodlands of the area, the salmon runs and other important ecological features. Many of the town's buildings, including the 1876 Market Hall, were built from stone from Llanelwedd Quarry. Much of the facing and other dressed stone used in the construction of the Elan Valley dams was also quarried here. The Quarry produced the first occurrence of laumontite in Wales. The quarry is currently operated by Hanson Aggregrates. 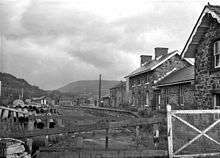 The town is served by Builth Road railway station on the Heart of Wales Line, which is located just over a mile to the north, having lost its more central (Builth Wells) railway station on the Mid-Wales Railway in the 1960s under the Beeching Axe. A dedicated cycle route linking the town with Swansea (NCR 43) has been proposed and a 13-mile section of the route from Swansea has already been developed. One of the main Wales north-south trunk roads, the A483, passes through the town, using the former railway route. As of June 2009 part of this road, along with the other main route through town (A470), is the subject of a transport study by the Welsh Assembly to help alleviate traffic congestion in the town centre. The 18th-century bridge at Builth Wells carries heavy vehicles on the A470. It has six fine masonry spans, with relatively small round cutwaters, which are fitted on the upstream side with stout steel fenders to provide protection from debris. The centre of the bridge has a pedestrian refuge on each side. The arches have been reinforced by a layer of concrete in the soffit. The bridge was built in 1775 and widened in 1925. The river here marks the boundary between the old counties of Breconshire and Radnorshire. Builth Wells High School is the local bilingual secondary school. In 2000 it was placed 67th in Wales for its GCSE results (5 GCSEs, grades A-C) with a pass rate of 59%. According to the latest report by Estyn, however, it now has a pass rate of 77% and is the 9th best performing state secondary school in Wales. The high school is also the 2nd best performing state secondary school in Powys after Llanidloes High School. For comparison, 95% of pupils in Christ College Brecon gained five or more GCSEs in 2008. Builth Wells is home to local rugby union team Builth Wells RFC also known as 'The Bulls'. The town is home to the Wyeside Arts Centre, which has two cinemas and a live performance stage. Builth Male Voice Choir has approximately fifty members and performs concerts to support local and national charities. Builth Wells also has a cricket pitch, tennis courts, a football pitch, a sports centre with squash courts, a 25m swimming pool and a bowling green. 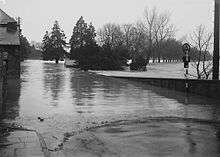 Flooding in 1910s; photo by Percy Benzie Abery. Builth Wells has a large number of Grade II listed buildings and fixtures. 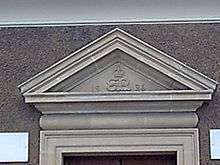 A plaque on the wall of the post office building claims that this is the only post office building in England and Wales bearing an inscription to King Edward VIII. ↑ "Town and ward population 2011". Retrieved 10 November 2015. ↑ "What's in a name: Builth Wells". www.bbc.co.uk. BBC. 2013. Retrieved February 12, 2013. ↑ Mills, A. D. (2003). "Builth Wells". Oxford Dictionary of British Place Names. Oxford University Press. ISBN 0191578479. Retrieved February 14, 2013. ↑ "Welcome to the Official Builth Wells Website". Retrieved 23 September 2014. ↑ "Llanelwedd Quarry, Builth Wells, Powys (Radnorshire), Wales, UK". Retrieved 23 September 2014. ↑ "Builth Wells Quarry". Retrieved 23 September 2014. ↑ Builth & District Heritage Society. "Builth Wells Town Walk". builth-wells.co.uk. Retrieved 9 June 2013. ↑ "Wyeside Arts Centre website". Retrieved 23 November 2016. ↑ "Builth Male Voice Choir website". Retrieved 23 November 2016. ↑ "Listed Buildings in Builth, Powys, Wales". British Listed Buildings. Retrieved 21 December 2014.